Happy Wednesday before Christmas A Jillian Vance Design fans!! Rosemary here on the blog today. Are you ready for Christmas?? I think I'm ready, lol!! 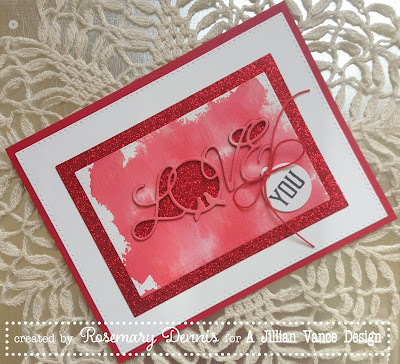 Today I'm sharing a little card that I made using one of the new Valentine's Day dies that A Jillian Vance Design recently released. 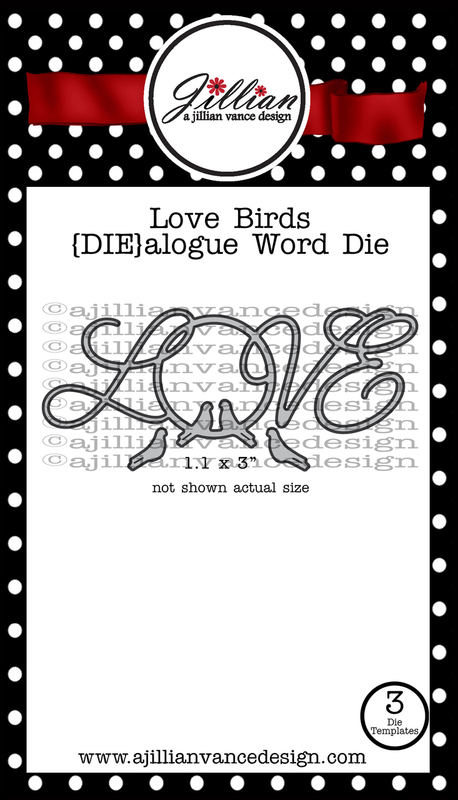 The one I'm using is called Love Birds. Love the beautiful script and delicate design of this die. I started by watercoloring a panel of watercolor paper using a red ink. 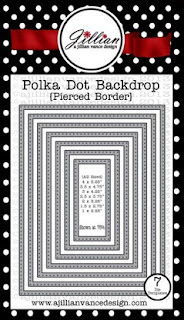 Once it was dry I die cut it with one of the smaller Polka Dot Rectangle backdrop dies and then a panel of red glitter cardstock with a Polka Dot Rectangle backdrop a few sizes larger. I cut the word from red cardstock four times and adhered all four together using a Quickie Glue pen. You need something like that as the word is so thin and delicate. The final word was die cut from the center of the watercolor panel and then adhered to the other four. I adhered the watercolor panel to the glitter panel and then inlaid the word back into the watercolor panel. 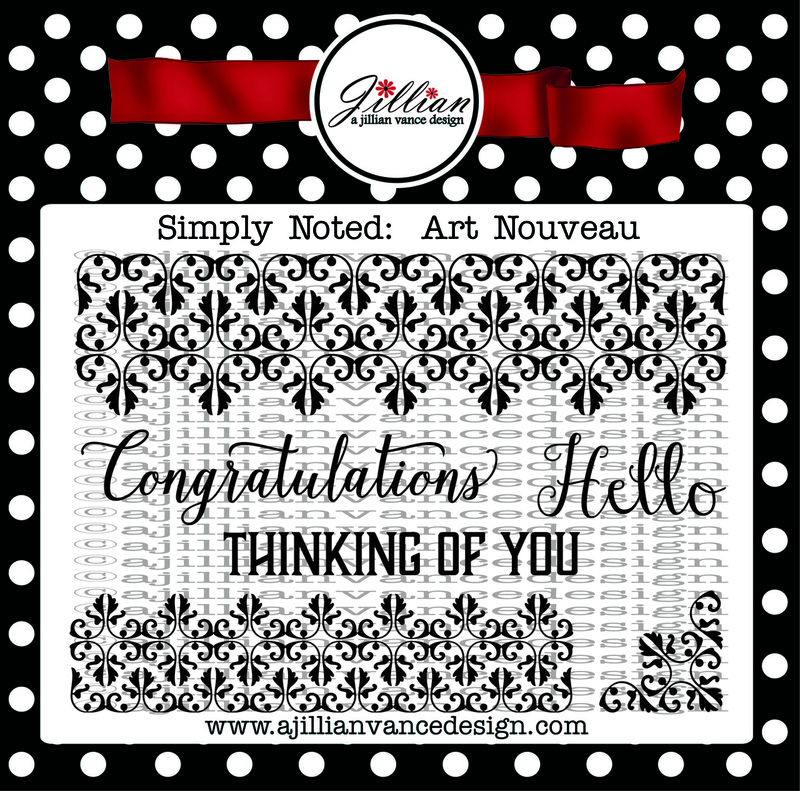 I stamped the word "you" from the Simply Noted Art Nouveau set in black ink on a small round tag, adhered that as you see and then added a little red twine bow. Everything was adhered to a white panel die cut with the largest Polka Dot Rectangle backdrop die and then to a red cardstock base. Thanks for stopping by today... wishing everyone a very Merry Christmas and a happy New Year!! 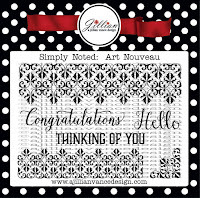 That's an amazing die & your card is over the top wonderful, Rosemary! 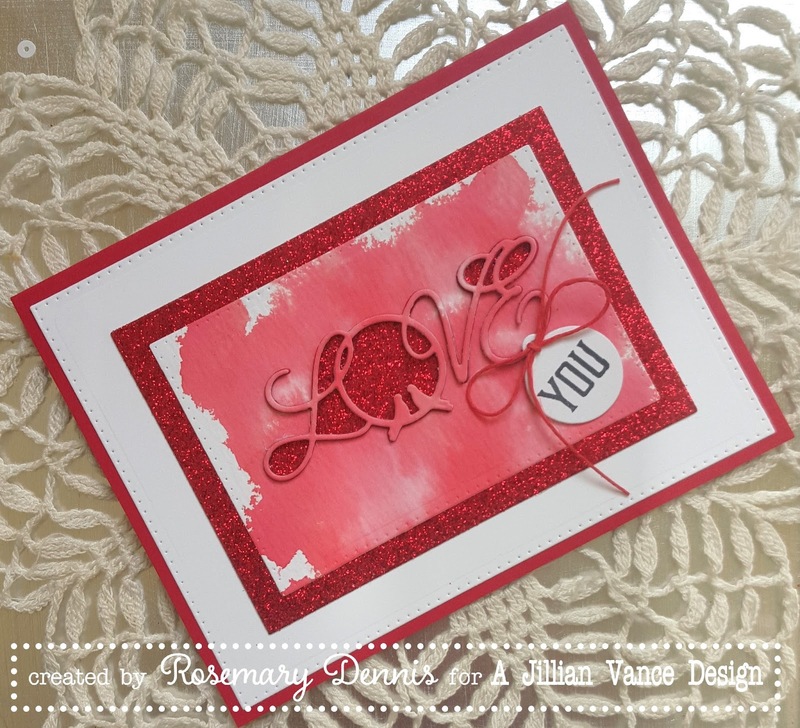 Love how you used the die cut over a watercolored background--I've been thinking of trying that! Maybe I'll have to buy myself a retirement present & finally get the Polka Dot Rectangle dies! Thanks for more inspiration & Merry Christmas! Wow that is a pretty die and your card is amazing!! The glitter and those little birds, love it!! Rosemary, what a beauty this is. 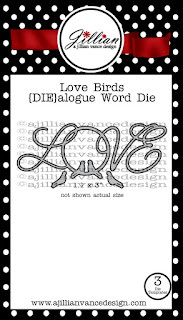 Fabulous water-colored background, "LOVE" die, & design.